A Look Back at Hunger and Undernutrition in 2015. Happy New Year! Despite our late start to this annual tradition, we wanted to share our most popular posts of 2015! As we carry on into 2016, we want to continue posting about current, innovative and thought-provoking topics and events while also featuring perspectives and insights from friends and colleagues. We love hearing from you and want to share your voice and experiences. If you're interested in becoming our next most popular post, please get in touch with us at humanitas AT humanitasglobal DOT com. Overcoming Hidden Hunger: Iron Deficiency. Iron deficiency is not only the most common micronutrient deficiency in the world but it also impacts the developed and developing world. In this post, I zeroed in on the many contributing factors, challenges and interventions relating to iron deficiencies. A Look at Breastfeeding Hurdles during World Breastfeeding Week. Though challenges to breastfeeding exist year-round, I wanted to highlight a few during World Breastfeeding Week. Especially interesting information that contributed to this post came from the 2015 Lansinoh Global Breastfeeding Survey. The Malabo Declaration: Will it End Hunger and Poverty in Africa? In July, I had the pleasure of hearing Dr. Abele Haile Gabriel, Director of Rural Economy and Agriculture of the African Union Commission, delve into African countries roadmaps for the year ahead in regards to the Malabo Declaration. Measurement Matters: The Food Insecurity Experience Scale and the Importance of Metrics. This guest post by Diana L. Caley, a Chicago Council for Global Affairs Next Generation Delegate, explores the levels of and supporting metrics for gauging food insecurity supplemented by her research in Uganda. 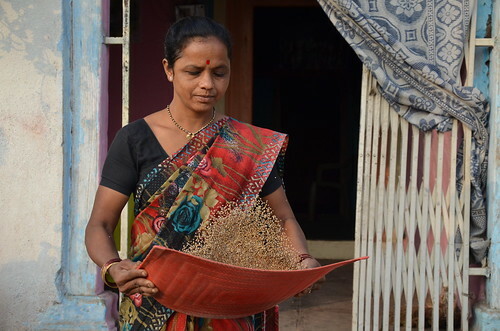 Hungry for Action – 2014 Was a Big Year for Nutrition…What’s Next? Lorena Cabrera, from Humanitas, gives an overview of food and nutrition security in 2014 and what it spells for 2015. One key resource was IFPRI’s 2014-2015 Global Food Policy Report, which identified overall accomplishments and challenges to achieving global food security. According to recent data from Food and Agriculture Organization of the United Nations (FAO), approximately 842 million people are hungry and malnourished. In addition, with our global population set to hit nine billion by 2050, the world must produce 70 percent more food than we currently produce to meet global food needs. Each and every man, woman and child should be able to realize their right to food, but this right is far from reach both globally and at home. In a world of plenty, living with hunger and malnutrition today and in the future should not be tolerated. It is precisely why the United Nations has launched a bold new call to action known as the Zero Hunger Challenge, which calls on the elimination of hunger and malnutrition in our lifetime. Strengthening and expanding partnerships, and deploying our collective strengths and knowledge to fill gaps will aid us in our goal of a hunger-free world. More importantly, it will change the lives of millions of people who go to bed hungry each night. Join us tomorrow, Thursday, January 20, 2014 from 12:15 - 1:45 PM Eastern Standard Time, for an International Food Policy Research Institute, Food & Agriculture Organization of the United Nations, and Community for Zero Hunger co-hosted event on the UN Zero Hunger Challenge. For those in the DC-area, the panel discussion will take place at the International Food Policy Research Institute at 2033 K Street, NW, 4th Floor Conference Room, Washington, DC 20006. For those that are unable to attend in-person but are interested in watching via webcast, you may do so via this link. In 2012, world food security remained vulnerable. Progress in the fight against hunger and malnutrition has been piecemeal, at best, and levels remain unacceptably high, with 870 million people hungry and 2 billion suffering from micronutrient deficiencies. New data from the Food and Agriculture Organization of the United Nations, and results from IFPRI’s own scenario modeling, suggest that on its current trajectory of tepid promises and unfulfilled commitments, the international community will fall far short of the Millennium Development Goal of halving the number of people who suffer from hunger by 2015. We have talked about improving smallholder farmers’ agricultural productivity for achieving food and nutrition security, but investment in agriculture, particularly agricultural research, remains low in many developing countries in Africa south of Sahara and South Asia. Investments by governments, the private sector, and farmers must increase and priorities must be carefully selected. We have talked about the green economy and sustainable development, especially at last year’s Rio+20, but the talk has not translated into specific commitments. We need to develop and implement an action plan to improve smallholders’ livelihoods while maintaining environmental sustainability—and turn farming into a modern, forward-looking occupation that offers a future for young, rural people. We have talked about gender equality and the positive impact this can have on improving agricultural productivity, but policies, strategies, and development projects should be designed with a greater focus on gender. We have talked about reforming agricultural policies in OECD countries to mitigate the negative impact on smallholder farmers in developing countries, but policymakers continue to distort markets with subsidies, trade restrictions, and other policies that have far-reaching repercussions. IFPRI’s 2012 Global Food Policy Report reviews food policy developments and trends with chapter-by-chapter discussions of major food policy developments, high-quality research, and perspectives of farmers from around the world. It also charts the path forward with a call to action on gender rights, employment in agriculture for youth in Africa, a needed evolution of US and EU support for their farmers, and regional policy reforms to promote food and nutrition security. The question now is: Will 2013 prove different? It must. In a landscape of rhetoric and promises, on-the-ground implementation must improve if the lives of the hungry and malnourished are to improve. It is time to walk the talk. On World Food Day 2012, nutrition is no longer the invisible, sectoral orphan of the development world. Momentum has been building since 2010 to reverse decades of neglect. With food prices again on the rise, solutions to undernutrition are increasingly recognized and interventions are being scaled up. There are still questions that need to be answered for sustained progress to be made – but this can be done in real time, learning as we act. Ban Ki Moon highlighted malnutrition as a global priority in his speech to the UN General Assembly last month. This comes on the heels of David Cameron’s Olympic legacy event that secured commitments on hunger and nutrition from global leaders. For the first time a British prime minister spoke of the urgency of addressing child stunting which blights the lives of 180 million young children. 30 countries have signed up to the Scaling up Nutrition (SUN) movement which is galvanising political commitment in regions suffering the highest burden of undernutrition. The development community and academics alike agree that malnutrition is a top priority. Earlier this year a panel of economic experts, including Nobel laureates, agreed that malnutrition is the most pressing development priority today (Copenhagen Consensus 2012). Chronic undernutrition impacts a child’s mental and physical ability undermining his or her future earning capacity. Waves of impact ripple out over time from the child, to households, communities and ultimately nation states, where undernutrition exerts a significant drain on economic growth. We now have a clear body of evidence of what works in addressing undernutrition. There are three levels of response. First, a bundle of 13 nutrition-specific interventions including micronutrient supplementation, support for breastfeeding and appropriate complementary feeding that can effectively target the first 1,000 days of a child’s life starting with conception. If these interventions are brought to scale, one third of the undernutrition problem will be dealt with. Second, there are a range of broader (“indirect”) development actions (in agriculture, social protection, water and sanitation, etc) that hold huge potential for improving nutrition so long as certain modifications in design, targeting and implementation are made. “Nutrition-sensitivity” is a notion that is gaining traction now within the development community. But to make this happen, at the third level, there’s a need to cultivate and sustain enabling policy environments and nutrition-friendly institutional and legal frameworks. This is crucial for incentivizing and facilitating actions at the other two levels -- scaling up of direct interventions and maximizing the nutrition sensitivity of indirect interventions. Nutritionists and programme managers have been focused on the first level for decades, the second for the last few years, and they are only now coming to realize the importance of the third level. Enabling environments are essential for the other two levels of action to succeed, and there is both an art and science in creating and sustaining them. In the past, nutritionists did their research, made recommendations and then implored politicians to do the right thing. More often than not, it didn’t happen. Now, there is a new focus on opening up the black box of “political will” to better understand (and ultimately shape) policy processes, to make nutrition more visible, and to hold political leaders to account if the neglect continues.